A hot bowl of Cream of Wheat on a cold winter morning takes only a few minutes to prepare on the stove or in the microwave. This hot cereal, made of enriched wheat farina, has been a staple in many American homes for generations and is known for its smooth and creamy texture. While it comes in several varieties, including a whole grain version, the 2 1/2-minute Cream of Wheat Enriched Farina is the original. Sugar, butter and milk are common toppings, but you can add any other toppings you prefer, including fruit, nuts, syrup and chocolate. Bring water or milk and a dash of salt to a boil in a saucepan on the stove. You'll need about 1 cup of water for every serving. If you are using milk, bring it to just below a boil it to prevent it from rising and spilling over the pot. You can also use half water, half milk if you don't want it too creamy. Slowly stir the Cream of Wheat into the hot liquid. Keep stirring as it returns to a boil, then reduce the heat to low. Use about 3 tablespoons of cereal for every 1 cup of water or milk. Stir the Cream of Wheat constantly as it thickens, for about 2 1/2 minutes, to prevent lumps from forming. Pour into bowls immediately when it has thickened to your liking. Add sugar, butter and milk to your taste. 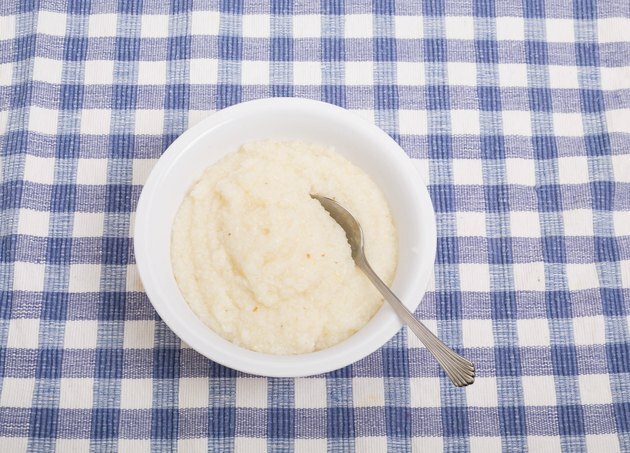 Combine water or milk, Cream of Wheat farina and a dash of salt in a large microwave-safe bowl. For every serving you wish to make, use 3 tablespoons of cereal for every 1 cup of water. Place the bowl in the microwave and cook on high for 1 minute. Open the microwave and stir the Cream of Wheat, then cook for another 1 to 2 minutes, stopping to stir every 30 seconds until it starts to thicken. Let the Cream of Wheat stand in the microwave for a few minutes to thicken to the consistency you prefer. Stir in sugar, milk and butter to your preference. Get creative with additional ingredients you can mix in after cooking the Cream of Wheat, including fruit like bananas and blueberries; sweeteners, such as brown sugar or maple syrup; chocolate chips or cocoa powder; chopped nuts, such as pecans and walnuts, and crunchy additions like granola. Prepare savory Cream of Wheat by adding butter, shredded cheese, salt and pepper. Keep a close eye on Cream of Wheat in the microwave. Microwave wattages vary, and the cereal can cook more quickly than expected, which can result in boiling over or becoming lumpy. Is Cream of Wheat Healthy?